After moving to Prince George and settling into my new community as I prepare to teach at UNBC (University of Northern British Columbia) for the upcoming school year, I returned back home to Sechelt… to work, rest, and spend time with my little family. Admittedly, it was a little strange. My little family kept on asking me about how it felt to not live here anymore. HELLO??? I still live here… and in PG for work. WE have TWO residences. This was apparently a BIG IDEA. Another big idea was looking through my “past life” shall we say through different lens. 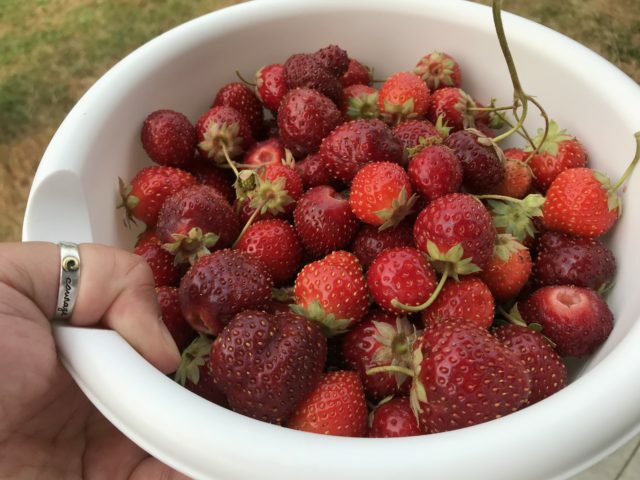 I loved giving Sally “dog hugs” and yes… picking strawberries from our garden. This was a big deal. I NEVER PICK BERRIES. It’s true. What kind of outdoor educator am I? So crazy, but I really appreciated the process and the product. Look at my harvest!!! Ok… I live in a strata and I picked every ripe berry in the garden the time. I was very rewarding and somewhat satisfying. I enjoyed cleaning up my house and leaving my house in a particular order. I loved calling up friends and connecting up with them to have coffee or go for a walk. It’s much more meaningful. What’s strange about this whole experience is that I’m not saying GOODBYE FOREVER, but I have said goodbye to other things to make this move happen. In return, I am saying HELLO to a full-time teaching position teaching pre-service teachers, HELLO to a new community, and HELLO to new possibilities. This excites me. Although I am not looking forward to being away (physically) from my little family in one month intervals, I am looking forward to the challenges offered by teaching and learning at UNBC School of Education. I was so glad to go back home for a bit and I am even more glad that my little family have travelled up with me to PG to visit, check out the new digs, and spend time with me. I was craving to turn the page of my last chapter and start a new one in my PEDAGOGICAL JOURNEY. Here I am in PG. Let’s see how this chapter goes. I’m stoked.